It provides both HSL and RGB values. Other graphics applications let you copy and paste the whole value. 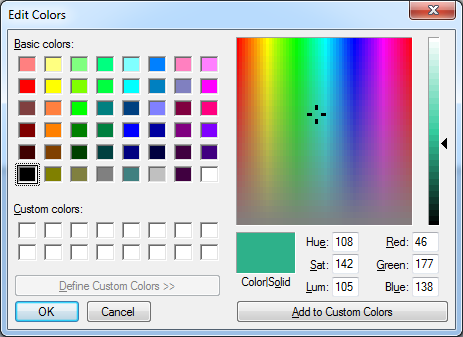 As an alternative do a Web search for colour picker and you will find the same sort of thing but online. Try a few of both types and use the one you like. Make sure you try some hsl pickers and ones with different layouts (e.g. the cylinder layout). If you really can't pick colours then there are tools which do it for you. Search for words such as Web colour scheme and you should come across things such as paletton.com which let you choose the mix of colours you want (complementary, triad etc.) based on an initial colour. If your page uses a single important image on it you can even get a range of suggested colours based on the image through services such as the De Graeve color palette generator. Point it to your image and it extracts colours which would go well with the image.